Common Name : Lantana Weed, Wild Sage, Shrub Verbena, Yellow Sage. Part Used : Lantana Leaves, Lantana Fruits. Habitat : Cultivated in specific areas. Uses : It has several uses, mainly as a herbal medicine and in some areas as firewood and mulch. The leaves are used to relieve itching. Other uses are against flu, colds, coughs, fevers, yellow fever, dysentery and jaundice. The roots are used for gonorrhea. The use of lantana extracts as potential biocides have been suggested. Lantana oil is sometimes used for the treatment of skin itches, as an antiseptic for wounds and externally for leprosy and scabies. Lantana repels other plants and other groups of organisms such as insects. 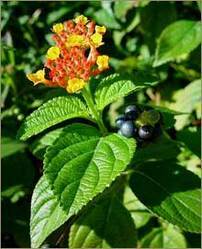 Lantana oil is used externally for leprosy and scabies. Plant extracts are used as medicine for the treatment of cancers, chicken pox, measles, asthma, ulcers, swellings, eczema, tumors, high blood pressure, bilious fevers, catarrhal infections, tetanus, rheumatism, malaria and atoxy of abdominal viscera.